Around 1800 the first stove that was made to cook on was developed by Benjamin Thompson, it was called the Rumford Stove. (Up to 1800, stoves were mostly used for heating, not for cooking.) One fire was used to heat several pots, which hung in the fire through various holes on top of the stove. This stove however was too large for domestic use. In 1834 the Oberlin Stove was patented in the US, it was the same technique but made smaller for domestic use. In the following 30 years 90,000 units were sold. During this time, the stoves still worked on wood or coal; while gas was available but it wasn’t used until late in the 19th century. In 1893 the first electrical stove was presented in Chicago, but only in 1930 these stoves were advanced enough to be sold for domestic use. Because the small houses of the working closses, the kitchen was often used for living and sleeping, and also as a bathing room. (No wonder: due to the stove that was almost constantly on, this room was probably the warmest place in the house!) While pots and kitchenware was usually stored on open shelves in the kitchen, curtains were used to seperate them from the rest of the room. Upperclass kitchens were of course the territory of servants only. Gradually, these houses got water pumps, sinks, drains, and sometimes even water on tap. With the closed stoves the kitchen became a cleaner place, because the fire was more restricted. 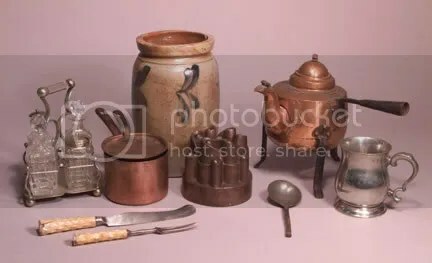 An exhibition of kitchen wares. Hi! Can you tell me where the third picture (full view of the Victorian kitchen) came from? I genuinely enjoyed reading through this posting.Thanks. Really neat information. It’s interesting to find out when certain areas or regions started using certain appliances or when they got gas lines. I’m having a Victorian influenced Wedding in March. My parents are catering, and I was just wondering what kind of menu they would have had for such and occasion? Also, this wedding is to be very formal. I really would love to have a masquerade ball for my reception, would that be applicable?? seriously causes me personally ponder a little bit further. I personally adored each and every particular part of this post. A great article. Our customers are always coming up with crazy kitchen ideas. We have one now that wants her kitchen to look early 19th century. Now I have to find out how to make granite and early 19th century work together so that she’s happy. Thanks for the article! I emailed her a link to it so that she can really see something from such an early genre’. A few years ago, I visited the Newport mansions, where the Gilded Age rich spent their languorous summers while plotting which daughter to marry off to any number of impoverished British noblemen. I found the kitchens to be the most interesting parts of the tours–maybe because I could envision real people working in them, in contrast to the over-decorated formal parts of the houses. I always love the kitchens the best. That and the bathrooms. Those places were human beings are just that little more human. A lovely historically relevant post about Victorian domestic life.